Best Rainbows- Sundrop Crystal Gifts $50.00 $45.99 On Sale! Ball 50mm or 60mm CLEAR or AB Ball 50mm: Gorgeous huge crystal ball, heavy, smooth, shining and shimmering, lots of beautiful bright facets. A full two inches in diameter. It may not sound like much, but for a crystal that's very dramatic. If you want a gift that will be sure to impress, yet is still affordable, this could be it! This crystal ball will make LOADS of rainbows! Ball 50mm AB: Big, round, beautiful, just like the Ball 50mm in clear crystal. 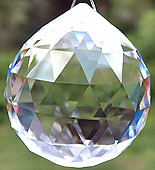 Add a touch of 24K Gold to a few facets, and you have a very special sparkling effect on a gorgeous crystal ball. Absolutely wonderful! Ball 60: Magnificent Crystal Ball, almost 2.5 inches!! Amazing Rainbows! Absolutely incredible beauty. 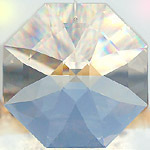 This makes a very special gift or a wonderful addition to your collection of crystal prisms. This is the size of a tangerine, apple, or orange. Sparkling and gorgeous. Treat yourself! You're worth it! Or choose it as a really amazing gift! 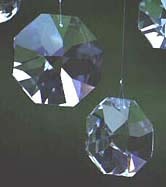 Genuine Swarovski Strass Elements $75.00 $65.99 On Sale! 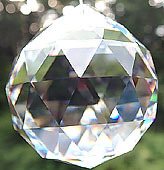 Ball 70mm CLEAR Big 70mm Crystal Ball in the New Sparkly Style With Extra Facets! That big crystal on your right is a 70mm Crystal Ball! Makes a great earring. Well, maybe not, it's very heavy! THIS CRYSTAL IS HUGE and GORGEOUS!! It is 2.75 inches across. Beautiful shining facets. It can fill an entire LARGE room with Rainbows all by itself! The crystal is perfectly clear and colorless. It looks red because the color from the maroon blouse pictured is reflecting into it. Splurge on this crystal, or give it to someone very special as a gift! The crystal on your left is a SwirlBall 40mm. You can compare the sizes. A 40mm crystal is over 1.5 inches, a good size, too! Note the different facet patterns of the Ball and the SwirlBall. This 70mm crystal is rare and wonderful and something you must have! GREAT RAINBOWS! Genuine Swarovski Strass Elements 8558 $170.00 $149.99 On Sale!